Today I enjoyed travelling to three sites for the California Spring Trials (CAST). I’m in Salinas, CA which is centrally located to visit all of the Northern CA sites for CAST. There are many other locations further south but I wanted to do these justice. I was the first to arrive at American Takii this morning and met the guy who had been sending us samples all of these years. All of the sites today included representatives of other smaller nurseries, pot suppliers, etc. so I was able to see a wide range of product aside from plants. I took MANY photos with these just being a very small fraction of course. 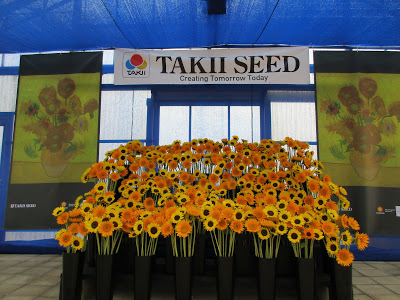 Today I saw American Takii, HMA Plants, Hilverdakooij (Dutch), Sakata Seed, Pacific Plug & Liner, Cohen Propagation Nursery, Hishtil (Israel), Jaldety, MPS and the Sunset Western Garden Collection. This was just the first day with much more to come! The weather here is in the 60s and has been rainy recently. Almost all of the trials I viewed today were in massive greenhouses. I’ll blog over the coming days as well to share my adventures. Included at the bottom are some shots of the ocean which beckoned within sight many times today!